During the forum, students were challenged by Carlene Hawkins, an employee experience specialist at Cargill, to be the example within their classes and communities to move toward the goal of inclusion as a reality for all. From there, the two-hour forum continued as Dean Floros encouraged students to continue striving for inclusion. 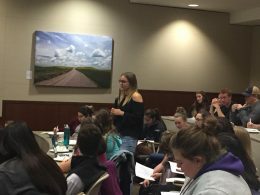 He offered hope for inclusion by citing a survey of new freshman in the College of Agriculture in which they used the word “home” to describe K-State. Dr. Zelia Wiley, Interim Associate Provost for Diversity in the College, wrapped up the forum by applauding students for uniting to discuss important issues and how to make a difference moving forward.